Aqua Flash gets up over Jess My Joy to post the top qualifying time for the John Deere Prairie Meadows Juvenile. ALTOONA, IA—SEPTEMBER 1, 2018—Prairie Meadows hosted two trials for the $62,190 John Deere Juvenile Challenge and two trials for the $54,270 Adequan Derby Challenge on Saturday's race card. The ten fastest qualifiers from both sets of trials will return to Prairie Meadows on Saturday, September 15th to vie for the winner's share of the purse in the two finals. The top two finishers will also earn starting berths in their respective championship races on Bank of America Challenge Championship Night, November 17th at Los Alamitos Race Course. Aqua Flash, a First Moonflash filly, racing owner Thomas Scheckel, posted the fastest qualifying time in the John Deere Prairie Meadows Juvenile by defeating Jess My Joy by half-a-length in the second of two trials Saturday. Under jockey Roberto Valero the gray filly completed the 350 yards in :17.604 seconds, a 96-speed index, to set the top qualifying mark. Trainer Shawna Manriquez saddled the Grade 1 finalist who has won three of four career starts. 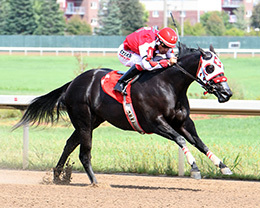 Bred in Utah by McColee Land & Livestock LLC, from the First Down Dash mare Aquafina, Aqua Flash suffered her only loss in the $1,024,840 Heritage Place Futurity(G1) at Remington Park after a troubled start on June 2. She has earned $74,645. For the complete list of the John Deere Prairie Meadows Juvenile qualifiers, times, sires, dams, owners, breeders, trainers and jockeys CLICK HERE. Trainer Stacey Charette-Hill saddled Curls Happy Wagon to the top qualifying time in the Adequan Prairie Meadows Derby Challenge trials on Saturday. Ridden by jockey Jorge Torres, the lightly raced daughter of leading sire Pyc Paint Your Wagon posted a :19.885 clocking for 400 yards in the first of two trials to set the top mark. The brown filly swerved in at the start but rallied to defeat second fastest qualifier Vallerro by a nose. An Oklahoma homebred for owner/breeders Michael Pohl and Martin Stacy, Curls Happy Wagon is out of the Spit Curl Jess mare Eye A Spit Curl Girl. A finalist in the 2018 Grade 3 Oklahoma Derby, she has won four of six starts and has earnings of $33,754. For the complete list of the Adequan Prairie Meadows Derby finalists, times, sires, dams, owners, breeders, trainers and jockeys CLICK HERE.